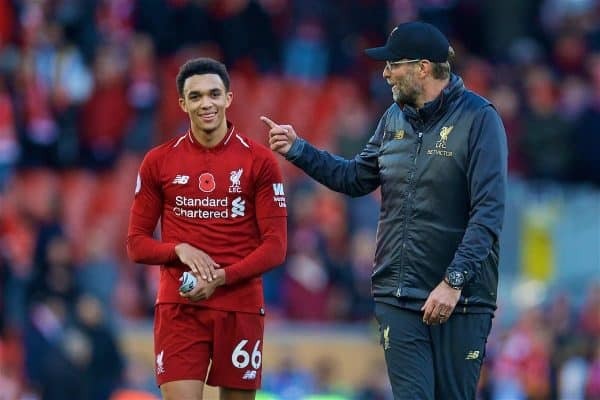 Jurgen Klopp has delivered the surprising news that Trent Alexander-Arnold “will be really close” to featuring in Liverpool’s clash with Crystal Palace on Saturday. Alexander-Arnold was expected to be rule out for up to month with a knee injury picked up in the warmup of last weekend’s 1-0 win over Brighton. He played the full 90 minutes regardless, and afterwards this decision looked to have backfired, as doubts emerged over his involvement in the next four Premier League games. But speaking ahead of Palace’s trip to Anfield, Klopp provided a positive update on the fitness of both Alexander-Arnold and Gini Wijnaldum, who was also reportedly struggling with a knee injury. 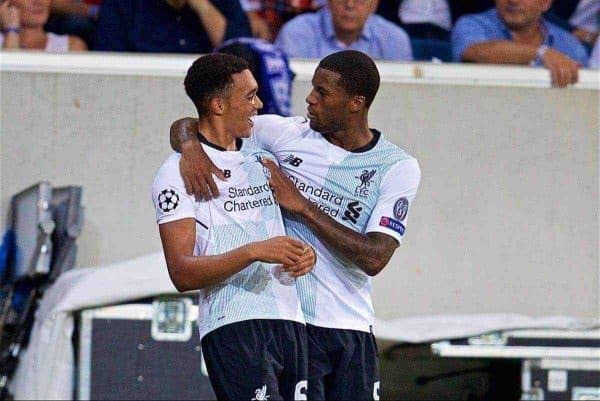 “So Gini and Trent, we will decide day by day,” he told reporters at Melwood. “That’s how it is, of course not cool. The exceptional part of that story is they both played 90 minutes [at Brighton]. “And I think the whole world saw what happened to Trent. What a boy! Unbelievable. “We played that game and afterwards got the information, obviously he had pain. “Nothing happened during the game, all stable, all good, it was just what happened before the game. “Adrenaline is obviously an interesting thing, it gives you the opportunity to do more than you expect. “We will see, for both for sure will be really close for tomorrow. The availability of Alexander-Arnold will be a major boost, with Joe Gomez already sidelined and James Milner otherwise pencilled in for a start at right-back. Alongside Gomez in the treatment room of late have been Joel Matip, Dejan Lovren and Adam Lallana, and the manager gave the latest on their fitness for the weeks ahead. “Dejan is much better than he was, but that’s a muscle thing and needs time,” he added. “I’m pretty sure he can be involved again against Leicester [on January 30]. “Adam trained yesterday, and the day before yesterday, so should be in contention. “We have to see, wait for the session today, to see how he reacted to two tough sessions. “Joe, no. Improving, improving, improving. We hope it will be quick from now, but don’t know exactly.